(Scheduled post.) Originally posted on Monochromia. 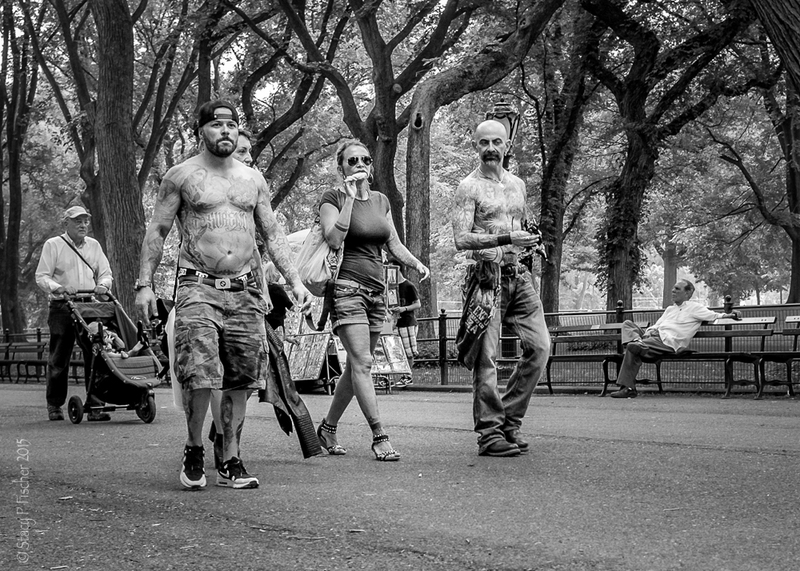 This entry was posted in Black & White, Monochromia, New York City, Places, Street Photography and tagged black and white, Central Park, Fuji X100T, New York City, photography, postaday, street photography. Bookmark the permalink. Yep, I knew it! haha! I love how much personality you captured in this photo! It makes you want to hear these people’s stories. Love your comment, Claire 🙂 It would be interesting, wouldn’t it? This picture works really well in black & white. Your eye is immediately drawn in to the characters and their body details. This is interesting on a number of levels. The person who’s hidden behind the guy in the foreground, the baby carriage and the guy on the bench. It’s almost as if what’s not the focus is as important as what is. Thanks, Robert! That’s was a happy coincidence.